I am sorry to see you suffer and yet glad that the cross is your portion. If I had at this moment the gift of miracles, I would not cure you, I should be afraid – the cross is far too precious to take away from anyone. Do not seek to rid yourself of it, rather love it, embrace it, and will to have it, because God wills it for you. COMMENT: These are tough words from Fr Doyle. For the most part, we do not like the cross. We generally desire to avoid it and to have a comfortable life where things by and large turn out as we want them to. The everlasting God has in his wisdom foreseen from eternity the cross he now presents to you as a gift from his inmost heart. This cross he now sends you he has gazed at with his all-knowing eyes, understood with his divine mind, tested with his divine justice, warmed with his loving arms, and weighed with his own hands, to see that it be not one inch too large, not one ounce too heavy for you, He has blessed it with his holy name, anointed it with his grace, perfumed it with his consolation, taken one last glance at you and your courage, and then sent it to you from heaven – a special greeting from God to you – an alms of the all-merciful love of God. 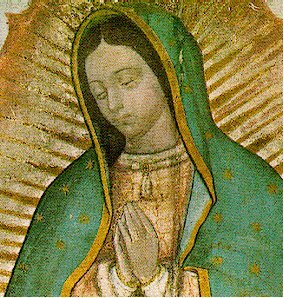 Today is the feast of Our Lady of Guadalupe. We can always turn with confidence to Mary who will win for us the grace we need to carry our cross.